Enjoy complete luxury as you board an airplane to take you to the Grand Canyon. You'l fly over historic Lake Mead, Boulder City, and Hoover Dam along the way to the Seventh Wonder of the World. You'll view the Colorado River as it winds it way through the length of the canyon. 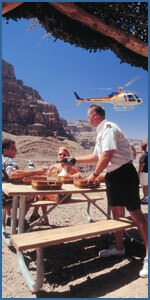 Landing at the canyon, you will board a motorcoach ready to take you on a tour of this impressive national park. Enjoy two impressive viewpoints allowing you to take in the sights of the canyon with great photo opportunities. Your tour includes a light buffet meal and tickets to the IMAX Grand Canyon for a historical film about the canyon. At the end of your tour you will return by airplane to the originating terminal. Journey into the heart of canyon country with spectacular views of the South Western deserts and the marvelous West Rim of the Grand Canyon. This fully narrated tour includes views of Las Vegas, Lake Mead, Hoover Dam, Grand Canyon, and the Colorado River! TOUR DURATION: 3.5 - 4 hours hotel to hotel (approximately). Tour includes complimentary roundtrip shuttle to and from hotel. You will experience stunning views of Lake Mead, Boulder City, Hoover Dam, and the Mojave Desert and well as great views of the Grand Canyon and Colorado River. Narrated in a variety of languages and set to music for a remarkable adventure experience. Amazing photo opportunities from the spacious oversized viewing windows. Exterior AND Interior tour of the engineering marvel that is Hoover Dam! Enjoy breathtaking views of the Grand Canyon from the comfort of a Vistaliner airplane with oversize viewing windows for unobstructed viewing and land at the Grand Canyon West Rim. Transfer to the bottom of the Canyon on a helicopter for a 4000 ft descent all the while taking in the remarkable colors and formations of the canyon walls. 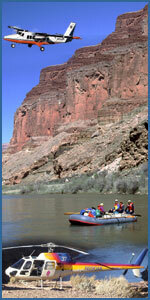 Board a waiting boat on the Colorado River and float downstream on the smooth water for a unprecedented perspective from the depths of the Canyon. Arrive at a waiting motorcoach and travel to Guano Point Visit the Indian Village, an exhibition of Native American buildings and construction techniques. A light meal is included. Journey to Grand Canyon West! 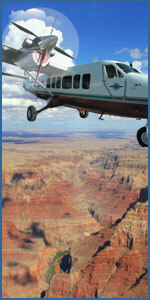 Includes aerial sightseeing of Lake Mead, Hoover Dam, and the West Rim of Grand Canyon. You can access the Skywalk from this tour! Travel by state of the art vistaliner airplanes from the Las Vegas valley to the heart of the Hualapai Nation. Upon arrival at the terminal use the convenient area shuttle service to reach the Indian Village. The village consists of five small exhibits depicting not only the Hualapai Tribe, but three other Arizona tribes and the tipis that represent many Plains Indian tribes. The most spectacular Grand Canyon Flight Experience with an Exclusive Landing on the Canyon Floor and EXTENDED Canyon Viewing Time! 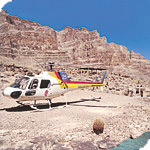 Embark on an unforgettable, narrated flight from Las Vegas to the floor of the Grand Canyon in complete Papillon luxury. Step back in time as you descend 4,000 feet into the depths of the Grand Canyon itself. The awe-inspiring rock formations dating back millions of years will envelop you as you gently descend into the chasms of the seventh wonder of the world. Touch down by the banks of the historic Colorado River in time to explore the pristine Native American Hualapai lands. Compliment your journey with a delightful picnic meal and refreshments served under an authentic Indian "Ramada". Your tour also includes majestic views of Lake Mead, the Hoover Dam, extinct volcanoes, and as a grand finale, you will see the world famous Las Vegas "Strip." Marvel at the modern architectural wonder that is the Las Vegas Strip! 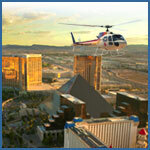 From your front row seat on board an A-STAR jet helicopter, during this helicopter Las Vegas Strip tour you'll see an eyeful of the world: New York, New York skyline, the towering Eiffel Tower at the Paris, the Luxor's pyramid, the soaring water show of the Bellagio, and the vast Roman Empire of Caesar's Palace. Besides the condensed globe below you, take in the world-class structural designs of such properties as the Wynn or the 1,149 ft. Stratosphere tower. Added to all that is a glimpse of the Downtown Glitter Gulch where Las Vegas began. 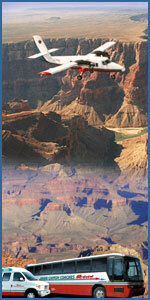 Get ready to experience the sights on this sweeping air tour in not often traveled regions of the Grand Canyon. Your tour takes you above and below the canyon rim, deep into the chasms and high above the peaks. Enjoy the magnificent sight of the canyon walls and impressive rock formations. Set to choreographed music and educational narration, you'll discover the wonders of the area. Take in the engineering feat of the Hoover Dam and Lake Mead, created after completion of the dam. You'll experience stunning sights like the Grand Wash Cliffs, Grapevine Mesa, and the Black Mountains. If lucky, witness a rare opportunity to see the elusive Big Horned Sheep. This tour offers breathtaking aerial views of the Hoover Dam, Lake Mead, Grand Wash Cliffs, as well as an aerial tour of the world famous Grand Canyon. On the return leg of your helicopter flight, you'll land in historic, and ruggedly unique Eldorado canyon for a champagne toast. Guests who have selected an additional excursions will, in Eldorado, join their guides while the rest of the party enjoys a smooth flight back to the heliport. You may add to this a mining adventure, horseback riding, kayaking, ATV adventure, or four-wheel drive tour. 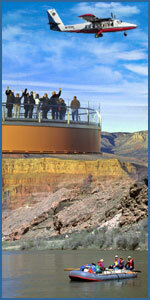 Experience the excitement of a Grand Canyon South Rim "Above and Beyond" 3 in 1 Combo Tour! 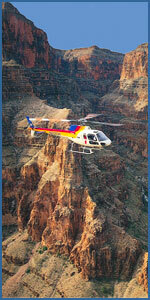 Combination Air/Ground with a South Rim Helicopter Tour! 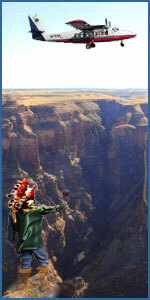 Our new South Rim getaway tour includes it all! 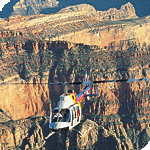 Roundtrip Airfare from Las Vegas* to Grand Canyon South Rim; A spectacular 30 minute narrated North Canyon Helicopter tour over the widest and deepest part of the Grand Canyon, with views visible only by helicopter, ground transfers, park entrance fees and meal complete your comprehensive canyon experience! Tour Highlights: Round trip airplane tour from the Las Vegas* area to Grand Canyon South Rim; Papillon North Canyon Tour; Park Experience. *Note: Las Vegas is served via Boulder City Municipal Airport. Complementary hotel shuttle service is included with your tour and covers all major Las Vegas hotel properties. Combination Motorcoach/Ground South Rim Helicopter Tour! Your motorcoach tour to the Grand Canyon begins with a photo stop at an Arizona overlook to see the spectacular Hoover Dam. Enjoy lunch in historic Williams, Arizona on Route 66. The excitement builds as you prepare to marvel at the canyon's legendary beauty when you board your Papillon helicopter for a breathtaking flight over the widest and deepest part of the Grand Canyon, choreographed to music and narration. 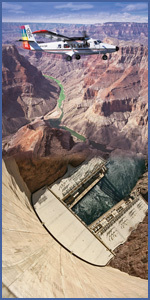 Journey over the canyon and see the beauty of nature's work and how the Colorado River formed this wonder of the world. Rejoin the motorcoach tour at Bright Angel Lodge and enjoy the view of the canyon from this great vantage point. You will have time to shop for souvenirs and Southwest Indian Curios at the lodge. Park entrance fees and meal complete your comprehensive canyon experience! 11 mile float trip down the Colorado River. Box lunch on a private beach alongside the Colorado River. Swimming is optional.